Delkin's 2933X XQD memory cards are now shipping and available for purchase. Delkin Premium XQD memory cards are capable of capturing cinema-quality footage, including DCI 4K & Full HD video at 180 fps, as well as 200 RAW photos in burst mode. POWAY, CA, JANUARY 31, 2019 - Delkin Devices, a manufacturer of flash storage solutions and camera accessories, announced today that their anxiously anticipated line of 2933X XQD memory cards is now shipping and available for purchase through select retailers. 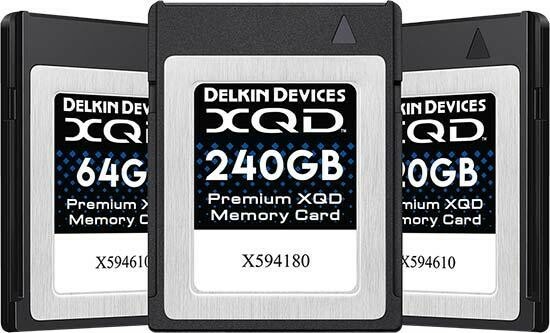 The latest addition to their ever-growing line of memory-based products, Delkin's XQD cards deliver blazing-fast write speeds up to 400MB/s and are specifically designed to excel in the latest generation of cinematic hosts, including Sony, Nikon & Phase One. Delkin Premium XQD memory cards are capable of capturing cinema-quality footage, including DCI 4K & Full HD video at 180 fps, as well as 200 RAW photos in burst mode. Compared with today's standard memory cards, XQD boasts improved performance and allows users to capture significantly more within the same amount of time. Testing in the Nikon D500 has shown that XQD cards take 47% more images (14-bit uncompressed RAW) than the fastest SD cards during a 10 second continuous shooting interval. As proof that Delkin's XQD cards are built to the highest standard, each card is serialized, like your camera. This allows Delkin to offer the ultimate level of customer support, while providing customers additional protection and insurance for their purchase. In addition to their "Lifetime Warranty" policy, Delkin also offers a unique built-in insurance policy for their XQD memory cards, called their "48 Hour, No-Questions-Asked Replacement Guarantee". Delkin will replace any non-working XQD card within 48 hours or less (not including weekends), prior to receiving the non-working card. Cards can also be replaced over-the-counter at any authorized Delkin XQD reseller. Delkin has also started shipping a USB 3.1 XQD adapter to ensure the quickest post-shoot backup. Utilizing a SuperSpeed+ USB 3.1 interface, the adapter is capable of offloading large files, quickly and efficiently at speeds up to 10Gbps (2x faster than USB 3.0)! It's perfect for on-the-go users who want to travel light while able to handle the high-performance demands of XQD memory cards that are used in the broadcast, cinema, and photography industries. Delkin products are sold through authorized camera stores worldwide. For more information on Delkin XQD memory cards, please visit www.delkindevices.com/xqd/. Delkin Devices' consumer group manufactures storage devices, such as memory cards and digital accessories, for the photography market. Delkin has been in business since 1986 and has offices located in the U.S. and Europe. High resolution images and samples are available for press and recognized members of the media. If you would like more information regarding this product or any other Delkin product, please contact Jenn Sherry at (714) 869-4264 or email at jsherry@delkin.com.